I carry a 10', 15' and 20' sections with the first two in the bumper and most of the time the 10' is all I need. 2001 standard box 7.3L E-350 PSD Van with 4.10 rear and 2007 Holiday Rambler Aluma-Lite 8306S Been RV'ing since 1974. I like the newer Rhino two section 20’ hose. One 10’ is all I have needed so far at a dump station. What I like is it stretches out to what you need without pulling back. I have stretched one to almost its max. Then it did pull back some. I have used the same Sidewinder since 2006. I have read where people do not see its use. I like to think a straight run to the glory hole in the ground will keep solids moving in the right direction during the gray water dump. Just me…. Two things about the Sidewinder. I only attach it to the Rhino at the beginning and the end of the Rhino because the hose is straight to the hole. No need for other hold down points. Gravity is wonderful. I anticipate how much the hose will flex under pressure at the beginning of the dump and that sag point is where I latch the high side of Sidewinder to. Should I also invest in a sewer support? I was also thinking of buying the 30 ft Sidewinder hose support. It seems like it would work at almost any length up to 30 ft...yes? Hose supports never hurt and have had to use mine occasionally. For the weight and the room required I wouldn't be without one. Most sewer openings in parks with full hook-ups are within about 6' of your sewer connection. A shorter hose, maybe about 8', is best. The other 99% can be everything from 25 to 40 ft of hose, stretched like a guitar string, to typically a 15 footer that covers most situations. I just spent the winter in a state park where they put hundreds of sewer connections about six feet from the pad, and six feet from the street. 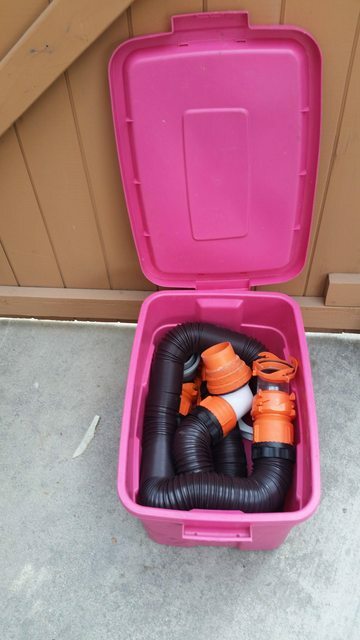 Over the last few years I have distilled the "kit" down to a ten gallon Rubbermaid storage container, with a 10 and 15 foot hose, and a clear 90* elbow. Seems to be the most useful collection so far. I have a 15' Rhino hose, plus a 10' Rhino extension. Fortunately, I haven't had to use the extension yet. After years of trial and error or what do I need or don't, I have come on a solution that has worked out for me,you may have to do the same. I carry it all in a Rubbermaid Tub. This consists of a 15 Foot Rhino Hose,mine has a white elbow downspout.and a Clear coupling just to make sure everything is gone. Most times I use the 15 ft one it has always been long enough,I have never had to put them both together. The 5 FT one I have used alone many times. My dump hookup is about in the middle of the RV so most times I am very close to the sewer dump. I also carry along the Sidewinder Hose support It can be used on short runs and long runs,I like to keep my hose off the ground if possible so it won't wear on the gravel or other surfaces. I have been in a few campgrounds that require them. I have also found that This little Wrench has come in handy several times.